With the launch of Google’s computerised self-driving car prototype and now the announcement that the Highway Code is to be reviewed to allow autonomous vehicles onto Britain’s roads, it’s apparent that driverless cars could be a reality sooner than we thought. These vehicles will have wide ranging implications for society – from how they are first introduced and integrated into our existing transport infrastructure, to how they will be accepted and adopted by consumers on a day-to-day basis. And once accepted, how will the design, planning, funding and ownership of vehicles and roads change? There’s no doubt that as the potential of automated vehicles unfolds, we will experience a massive shake-up of the social, cultural and behavioural customs which we have become used to. Introducing automated vehicles to society will not happen overnight – it will be a step-by-step process involving a mixture of technical, social, financial and cultural elements. Due to the complex nature of our existing transport systems, we cannot simply place automated vehicles into our cities and expect them to immediately function alongside existing transport and infrastructure. "The first place where we may see these autonomous vehicles will be in an out of town environment such as a motorway, or highways which pedestrians do not use." 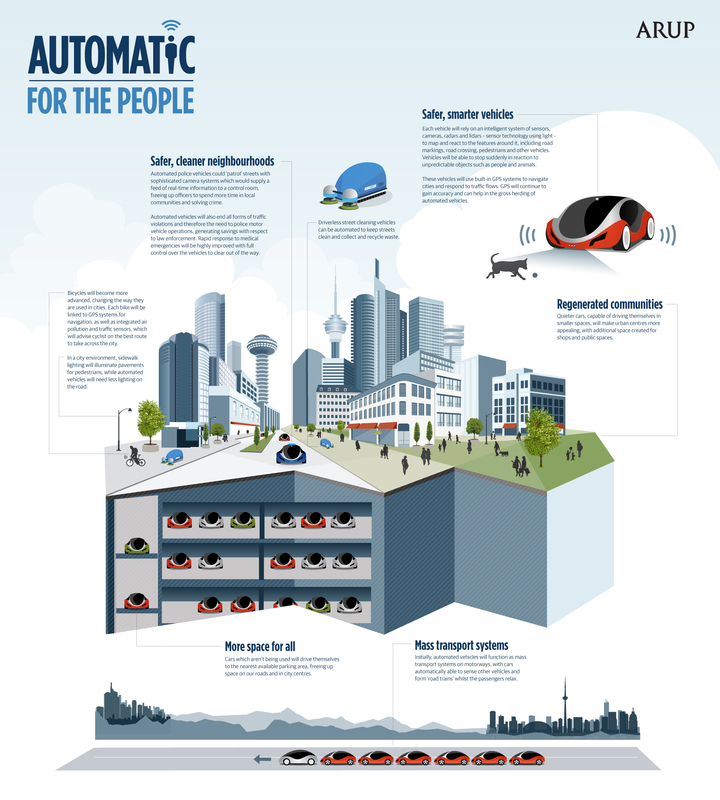 Instead, the first automated vehicles are likely to appear in a city scape where dual-mode vehicles (ie cars with fully autonomous capabilities which can still be controlled by a driver where necessary) operate autonomously in certain peripheral hubs. People will then continue their journey into the city on segregated systems or driving themselves. Putting this concept into practice; the first place where we may see these autonomous vehicles will be in an out of town environment such as a motorway, or highways which pedestrians do not use. We will also need to adapt current infrastructure systems so that autonomous vehicles can effectively ‘communicate’ with the city around them. Each car will rely on an intelligent system of sensors, cameras, radars and lidars – sensor technology using light - to map and react to the features around it, including road markings, road crossing, pedestrians and other vehicles. Ensuring that these vehicles can react to absolutely any external stimuli, whether this is police instructions, temporary roadwork signs, current weather conditions or approaching emergency services vehicles is essential if we are to see a successful and safe integration of these vehicles into our cities. Alongside the initial physical integration, driverless cars also need to be trusted and accepted by consumers before they can become a day-to-day part of society and city living. The key to success here is making the vehicles affordable, reliable and accessible transport solutions. Similar to the diffusion of other technologies, initially, automated vehicle adoption is likely to be initiated by specific applications and markets, such as taxi services or logistics providers. These applications will increase awareness and trust in the technology and thereby encourage adoption by wider consumer groups and eventually, private individuals. "Manufacturers will lease automated vehicles to the consumer on a per-trip basis, providing a profitable return for the manufacturer and an affordable transport solution for the end-user"
In terms of vehicle ownership and use across the mass market, uptake will no doubt be gradual until full trust and acceptance has been achieved. When the first autonomous cars do become available to the general public, we can expect to see an entirely new model of manufacturing and ownership, with these vehicles being offered as part of car sharing schemes in the first instance. Car sharing is already becoming more popular in developed nations as consumers try to rein in spending, avoid large bulk payments and eliminate the headaches of car ownership. With this new model of ownership for automated vehicles, manufacturers will lease automated vehicles to the consumer on a per-trip basis, providing a profitable return for the manufacturer and an affordable transport solution for the end-user. This process will also provide an opportunity for the diffusion of new technologies amongst everyday users. In the longer term - and as these cars become more integrated into urban environments and everyday travel - we are likely to see collaborations between private companies, governments or local authorities, or even IT companies who will own and maintain a fleet of autonomous vehicles for consumers. While the timing and acceptance of these vehicles may be under debate for a while, one thing is clear – automation will have a massive impact not only on the shape and nature of vehicles themselves but on every aspect of our lives, from working practices to shopping; the layout and space of our cities and residential areas; from government policy right through to our personal finances as our perceptions and attitudes towards owning and running vehicles change.